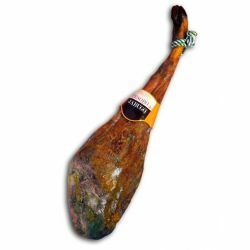 Tesoro de Jabugo Iberian Cebo Ham. Spanish traditional food. TheTesoro de Jabugo Iberian cebo ham comes from an excellent variety of Iberian pigs reared in the popular area of Jabugo (Huelva) and fed a diet based on natural forage, well selected and seasoned in the cellars for delight gourmets . With excellent aging ranging from 18 to 24 months which makes its flavor a precise taste, intense and pleasant with the benefits of oleic acid recommended for all ages. Piece of 6.5 - 7 kg approx.